The Laotians epitomize the ability of recent immigrant communities to hang together and promote their traditional culture and values while they (especially the younger generation) embrace American culture and values. That sense of unity will serve them well in the months to come, as they rebuild “their heart and soul,” as one tearful women described the temple. I visited the temple yesterday afternoon and felt an indescribable sadness for their loss. Firefighters were still milling about, sifting through debris, probably investigating the cause of the fire. Police blocked the street (the temple faces a side street, not Wadsworth Blvd., which is a major thoroughfare). But a steady stream of Laotians kept coming by, parking their cars down the block and walking to the temple to pay their respects and offering their help. One young man sitting in his car with his baseball cap askew rolled down the window and turned down the hip-hop on stereo to ask me details about the fire. I told him what I knew. He told me he’d helped the head monk for several years and considered him a mentor. A woman who parked her car and began walking began sobbing when she got her first look at the burned-out skeleton of the temple. She said she left work early when she first heard about the fire. Many of the visitors had just heard about the tragedy through the community grapevine while at work. 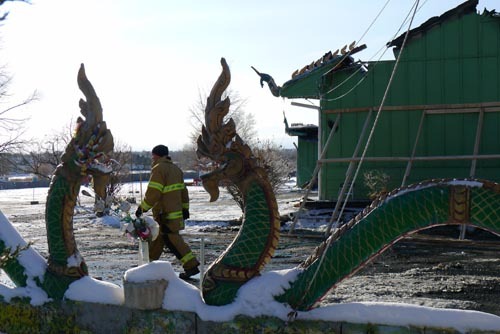 The community has established the Lao Buddhist Temple Fire Relief Fund at 1stBank, a Colorado-based bank chain, and is accepting donations to help rebuild the temple. You can find the nearest 1stBank location here, or call Sy Pong at 720-210-7555 or Maly at 720-217-6142. It’ll help the Laotians bring back to life the heart—and soul—of their community. Please support Colorado’s Lao Buddhists. You can learn more about the situation at the links below. If you donate more than $250, I’ll send you a thank you card. More importantly, you’ll be providing enormous help to a Buddhist community that dearly needs it. Update: In response to a question on Twitter, the fire occurred in Westminster, a suburb northwest of Denver. You can also get more information about donations at the temple’s website: laobuddhisttempleofcolorado.com.